SB Signs is a passionate team of sign professionals. Our production team have sixty years of combined experience between them. We want to make your business look good and we want you to succeed. We take pride in our work and only let the highest standards out our door. Our creative team constantly try new things with new materials to expand the options available to you and make your signage stand out. We are committed to the rebuild of Christchurch. We want to see this beautiful city of ours come back better and stronger. We want to do everything we can to make that happen. Our graphic design team will focus on your company image and message to create signage that ensures you get results out of your signage budget. We are passionate about delivering your business a quality product with quality service. Your experience with us will assure you that you are dealing with professionals. Custom made and manufactured from high quality materials with the option of illumination. Our team can remove and install any signs you have on current or new premises. We can offer a range of different garment printing methods to suit your needs. We can build custom plinth signs to suit your needs. Our team is specialised in all areas of sign writing. We can produce traditional signage including hand painted signs. We can print on a wide range of materials including; vinyl, PVC banner, one way vision, transparent/clear vinyls. We can help transform your building whether you need lightboxes, printed panel signs or hand brushed signwritting. From magnetics to full vehicle wraps and everything in between we can signwrite your vehicles to give you 24/7 advertising. Whether you need logo design or expand your existing branding we can take you through the process. Thank you for all the excellent preparation and workmanship completed on our Building at 559 Blenheim Road Sockburn recently, It was nice to know we could call on yourself who has a wealth of knowledge in this field, and I noticed this job incorporated many of the older skills you have obtained throughout many years in this industry. With you having these skills on board it meant to me Elite Fitness were getting the best job and solutions at all times, and I must say for a very reasonable price also! Your clever marketing/display tips were top on the list also.The finished product on Elite Fitness’s Sockburn branch speaks for itself, I would not hesitate in highly recommending SB Signs and Kerry McRoberts in particular for any Sign writing requirements any client may be considering. I am happy to be contacted anytime by your clients for more detailed comment if required. As is often the case when a lay person looks to embarking upon something new, they have no idea how best to go about it. They need help and assistance from those that do know, those that are professionals in there field. This was just the case when we approached SB Signs with some simple ideas toward advertising on our vehicle. We thought we had a pretty good idea as to what we wanted, but when the mock-ups were sent to us and we saw our idea, and the idea from Kerry and Georgette we were absolutely sold on their creative input! It became a process of patience as we waited for copyright permission from an artist in the USA, and throughout this time the contact with SB Signs was wonderful and their patience made us feel continually welcome. When the time came to have the work done, the final check of the plans with Georgette was great, her personal input and advice was very welcome. The professional advice given by Kerry was excellent and we felt comfortable letting him use whatever adaptations necessary to create the best effect to the finished product. We will recommend the team at SB Signs to everyone gladly. A huge Thank You, to you all! On behalf of the Aranui Community trust Board Members, Staff and community i would like to say “thank you” for the excellent Signage you provided our organisation at 35 Hampshire Street. We have received an overwhelming positive response to the artwork. Our community loves the wall. In my 11 years working with the trust this would have to be one of my highlights. The impact of such work has definitely lifted our community. The “It’s not Ok” family violence message combined with our Health Kete, Whales Tale and Aranui Community trust Mission and logo seems to have been the perfect selection for the wall. The colours are so rich and are a perfect match to our artwork specification. The frosting work on the outside of windows has also been a hit along with the artwork on the inside of our new Earthquake Support Coordination Centre. We got exactly what we ordered and I like business like that. It was a real pleasure dealing with Kerry and Georgette who was very professional at all times. The speed and efficiency of this two man team was outstanding. The timeliness of this project was perfect from contracting SB Signs to do the work to the competition of the work. If anybody would like a more in detail testimonial I am happy to talk to you direct. I will always use SB Signs for any future Signage in Aranui. Dear Kerry, I am writing to express my gratitude at the professional, friendly and helpful service you ( SB Signs) provided for the sign writing of my vans. We are not only happy with the result but wish to thank you on the time and efficiency you took to complete the job. I would like to congratulate Kerry and his team of sign writing technicians on behalf of our company, “Town and Country Roofing Ltd”. SB Signs team of experts professionally managed our company’s needs for advertising clearly and concisely to our cantabrian clientele, and over the last two weeks not only has our website increased its volume of hits, but our free phone business number has also increased with inquires and public interest too. We have currently reserved SB Signs talents again to produce some core-fluted company signage and flyers for this year’s Canterbury Home Show. Not only have SB Signs made our company look and feel professional but they have made our dream come true and we will endeavour to use their unique services in the near future again and again. 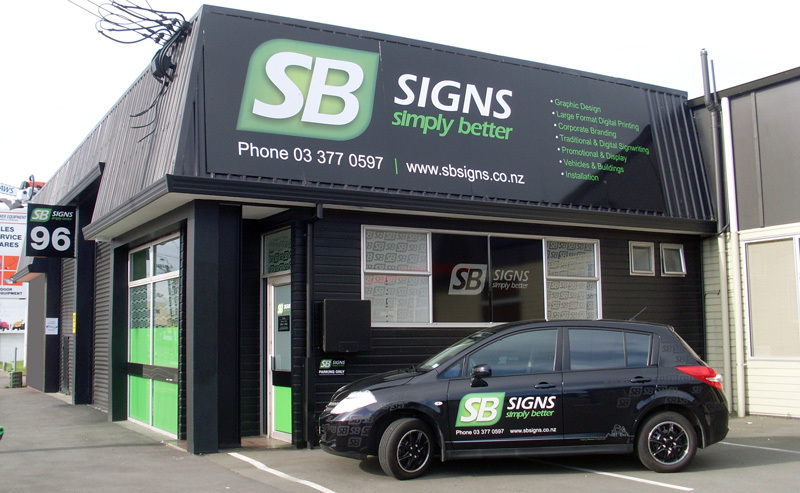 Like ourselves SB Signs have made a commitment to help Canterbury Rebuild by rebranding your business and much more. 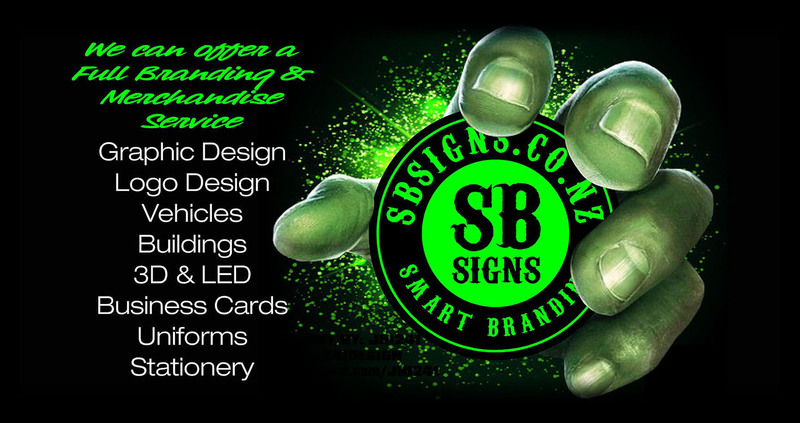 We have no hesitation in recommending Kerry and his team at SB Signs to anyone. Many thanks and all the best for your future. Thanks again for the amazing job yesterday, as follows a testimonial from us. We have relocated our business post quake, and have been extremely fortunate to have the services of Kerry and Georgette from Simply Better Signs. We feel the signage of our windows is outstanding and have had many comments from our client's telling us how professional and stylish our windows look. All the guess work was taken away from us as Kerry and Georgette helped us with options and designs to come with the amazing end result. Not only is their work of extremely high quality but there professional, helpful manner exceeds any other quotes we received from others.. guys thanks again we love our signage and will certainly be telling everyone! Kerry and the team at SB Signs have been great. After being recommended by another one of their customers, I made contact and they visited my premises to discuss my requirements and measure up. Kerry took the time to run through the options we had and the best products to use for the best result at the best price. The team have done shop signage and also vehicle sign writing for me. The sign quality was brilliant and turn around time was quick. He even delivered the signs personally. The price was significantly lower than other quotes I had. The vehicle signage they have done for me is brilliant. With such a large area to cover and with the signage going across doors and windows, I never thought it would turn out so well. The vehicle looks brilliant and good quality material has been used so it still looks as good as the day it was done. Kerry went the extra mile putting on bonnet and window stickers which has just made the vehicle. I am very pleased with the result and professional finish and I will certainly be using them for any future work. I have even received follow up calls to check I was happy with the job. After the Christchurch series of earthquakes forced us to relocate our retail sales presence to an alternative position on our own site we realized our existing signage was not appropriate and not positioned correctly for the changed location. We had an idea in mind that if executed correctly would give us the wow factor we were looking for. We drew up the concept and asked Kerry McRoberts of SB Signs to comment on, and price, the idea. The whole process from concept discussions, pricing through to installation went very smoothly. We are very pleased with the end result and would recommend SB Signs. Copyright SB Signs Christchurch © | Terms & Conditions | Disclaimer | Website by EZ web. These terms and conditions apply to the use of this website ("Site"), including the purchase of goods over this Site. In using this Site for these and other purposes, you agree to be bound by these terms and conditions. Please read them carefully. If you do not accept these terms and conditions, you must refrain from using the Site. These terms and conditions must be read alongside other applicable terms and conditions governing the use of the Site Standard Terms of Trade ("Terms of Trade") of SB Signs or its related companies, agents, suppliers or licensors Standard Terms of Trade ("Terms of Trade"). In these terms and conditions the expressions "we", "us" and "our" are a reference to SB Signs , or our or their related companies, agents, suppliers or licensors. Amendments to terms and conditions, we reserve the right to amend these terms and conditions from time to time. Any amendments will be effective immediately upon notification on this site. Your continued use of this site following such amendments will represent an agreement by you to be bound by the terms and conditions as amended. Except where otherwise specified, any word or device to which the ™ or ® symbol is attached is a Trade Mark owned or licensed by us (the "Trade Marks"). If you use any Trade Marks in reference to our activities or Goods, you must seek our express authorisation and at all times comply with Clause 20 of the Terms of Trade. You must not use the Trade Marks in: (a) or as the whole or part of your own trademarks; (b) connection with activities or goods which are not ours; (c) a manner which may be confusing, misleading or deceptive; and/or (d) a manner that disparages us or our information or the Goods (including this Site). It is the policy of SB Signs to send our members emails throughout the purchasing process and other newsletter emails they elect to receive. Further, it is our policy to immediately remove any member from any mailing list upon the member's request. In addition, SB Signs will send out promotional material to its newsletters subscribers promoting material related to SB Signs . We do use email as a means of receiving feedback from our members, and we encourage you to email us with your questions or comments. We will preserve the content of any email you send us if we believe we have the legal requirement to do so. Your email message content may be monitored by us for trouble shooting or maintenance purposes or if any form of email abuse is suspected.